One mom shares all about her baby girl's battle with whooping cough. British Columbia resident Annie Mae Braiden posted an incredibly sad photo series to make a larger point: That if you're not vaccinating your children, you're not only putting them at great risk—you're also putting your entire community in danger. Braiden shared the photos of her own infant, Isabelle, in the hospital fighting for her life. They're heartbreaking and they bring up an incredibly important point about herd immunity. Braiden's daughter wasn't old enough to receive the whooping cough vaccine (infants usually don't get this vaccination until they're two months old). Though Isabelle wouldn't have been able to get the vaccine herself, the fact that whooping cough even exists today—when a vaccine was developed for it in the 1940s—led Braiden to speak out. “So I wasn’t going to do this, but I think people need to see what not vaccinating their kids does to the OTHER kids, like my 6-week-old daughter,” Braiden posted. “Isabelle has been in the PEDS ICU since she was 6 weeks old (now 10 weeks) with whooping cough. 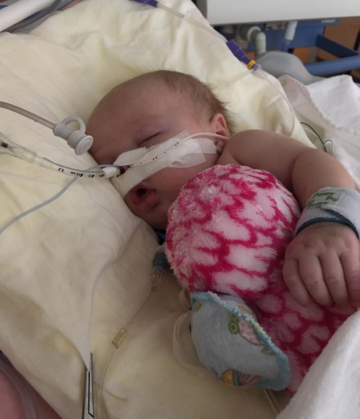 She was on a ventilator for 3 weeks and CPAP for 3 days (she was the lucky baby, the other ones have been ventilated for months) and we’re still facing another 2 months in the hospital." There are children who can't be vaccinated for medical reasons, and Braiden makes it clear that she's not addressing them or their parents in this post. What she is arguing, however, is that those who can vaccinate their children should, as this could help prevent these health issues from spreading to the children who cannot be protected. "What you do with your kids is your choice but do not tell me that not vaccinating your kids isn't hurting anyone but your own kids," she wrote. "Isabelle is proof that it harms the other little babes who aren't old enough to get their vaccines yet. My son is vaccinated to protect himself and the other kids he's around. It never crossed my mind to not vaccinate—I want to protect my children and other children. Please vaccinate your kids, it's not fair that my little girl is in the PICU coughing and not being able to breathe from a disease that shouldn't be around in this day an (sic) age." The Centers for Disease Control and Prevention (CDC) recommends that infants and children get the childhood vaccine that includes protection against whooping cough, diphtheria, and tetanus (DTaP) at 2 months, 4 months, 6 months, and 15 through 18 months of age. A booster of DTaP is given at 4 through 6 years of age. Because protection from DTaP fades over time, CDC recommends another dose of whooping cough vaccine, known as Tdap, for adolescents (ideally at 11–12 years) and women during each pregnancy (ideally in the third trimester). Adults who have never received Tdap should get one dose now. By protecting themselves, older children, new mothers, and other adults can form a cocoon of protection around the babies in their lives that may be too young to be fully protected by DTaP.